The single most important decision confronting the first Smithsonian Board of Regents in 1846 was the selection of the Institution's first Secretary. Joseph Henry became a candidate for this prestigious position based on the idea that the Secretary of the Smithsonian should be an accomplished scientist, someone with an international reputation. Few would dispute that Henry fit that description. Henry had been a professor of natural philosophy at the Albany Academy in New York and at the College of New Jersey, now Princeton University. Among his discoveries were mutual induction, self-induction, and the electromagnetic relay, enabling him to devise the first electromagnetic telegraph that could be used over long distances. He had also designed the most powerful electromagnets of his day, invented a type of electric motor, and discovered the concept of the transformer. Henry's "Record of Experiments," three volumes of laboratory notes, provide insight into his most important research at Princeton and at the Smithsonian. As head of the Smithsonian, Henry found little time for his own research. He remained committed to basic research, however, and saw the support of original scientific work as the Smithsonian's primary mission. Smithsonian Contributions to Knowledge, launched in 1848 and usually published annually, disseminated original research in a wide variety of fields, including anthropology, astronomy, chemistry, and natural history. The series was inaugurated in 1848 with a seminal work in American archaeology, then a relatively immature field of study. Ephraim Squier and Edwin Davis's Ancient Monuments of the Mississippi Valley, provided the most detailed description to date and over 250 illustrations of the mounds and other formations that dotted the Ohio and Mississippi Valleys at that time. Henry later published what is now considered a landmark in American ethnology, a six-hundred-page work by Lewis Henry Morgan on kinship, and was instrumental in the documentation of Native American languages and cultures. Henry did continue to conduct some of his own research and experiments in his role as the federal government's chief scientific adviser. Henry served, for example, on the United States Light-House Board from its inception in 1852 until his death in 1878. During these years, he chaired the board's committee on experiments, and is credited with introducing numerous innovations through experiments he conducted or initiated on methods of illumination and on the acoustics of fog signals. Henry was also consulted for scientific advice during the construction of the United States Capitol, and conducted experiments related to the building's marble, heating and ventilation, and acoustics. Alert to the practical applications of basic research, Henry devised methods for testing the cohesive force of particles in the marble being considered for use in the US Capitol extension. Henry later advised on the protection of the Capitol Building from lightning, a subject he had researched during his Princeton years. Aeronautics was another area of special interest to Henry, in part because he saw balloons as potentially useful for collecting meteorological data. In 1854, Henry published an article in the Smithsonian's annual report 3, based on meteorological observations made by balloonist John Wise. He later pointed to Wise's observations in discussing a class of winds now known as the jet stream in an article subtitled "Atmospheric Vapor and Currents." 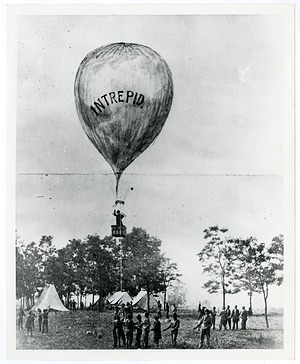 4 In 1859, Henry outfitted a balloon manned by Wise with "gas, conductors, ropes and meteorological instruments" to collect data for the Smithsonian. 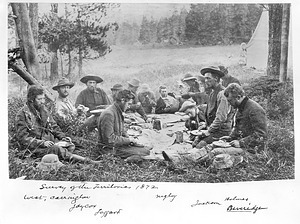 Henry also provided meteorological instruments and other scientific equipment to government surveys and exploring expeditions, in addition to identifying scientists to collect information and specimens. Henry's wide network of scientific colleagues gave him access to specialized equipment and information. When, for example, astronomer James Melville Gillis requested help with measuring earthquakes in Chile, Henry sent him a nine-page list of observation guidelines prepared by geologist John Lord Hayes. Although aware of a seismometer that had just been developed in Germany, Henry deemed it too complicated for Gillis's purposes.5 In addition to providing advice to the government, Henry was regularly consulted by inventors and others engaged in scientific pursuits. Among them was Alexander Graham Bell, later credited with the invention of the telephone. 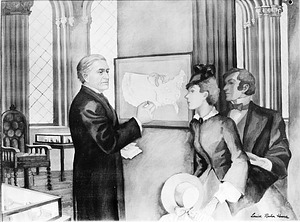 After Bell demonstrated for Henry an apparatus he had "designed for the transmission of the human voice by telegraph," Henry called it the "germ of a great invention," and advised him to continue working on the project.6 A year later, Bell succeeded in transmitting the first intelligible human speech over the telephone. 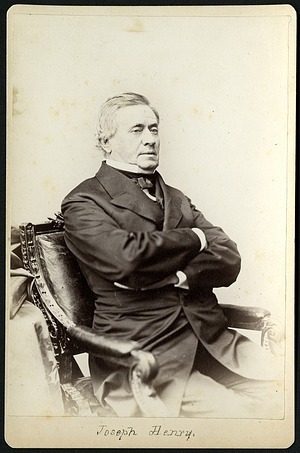 Although Joseph Henry never ceased thinking of himself as a research scientist, he was forced to put aside his own research agenda once he was appointed to lead the Smithsonian. His career as a physicist, however, had a profound impact on his leadership. Henry's top priority was to support basic research, and his dedication to this vision throughout his secretaryship shaped the Smithsonian's future. "The discovery of to-day, which appears unconnected with any useful process, may . . . become the fruitful source of a thousand inventions," wrote Henry in his 1851 annual report.7 It is this vision that drove Henry's persistent calls for the Smithsonian to prioritize the support and dissemination of basic research throughout his tenure. Albert Moyer, "Joseph Henry: Scientist and Christian," Smithsonian Institution Archives. Frederick Seitz, "Joseph Henry Papers Project: A Physicists Persepective," Smithsonian Institution Archives.